The official OpenBSD bookstore now carries both DNSSEC Mastery and Sudo Mastery print. If you buy the print from them, you get the ebook as well. 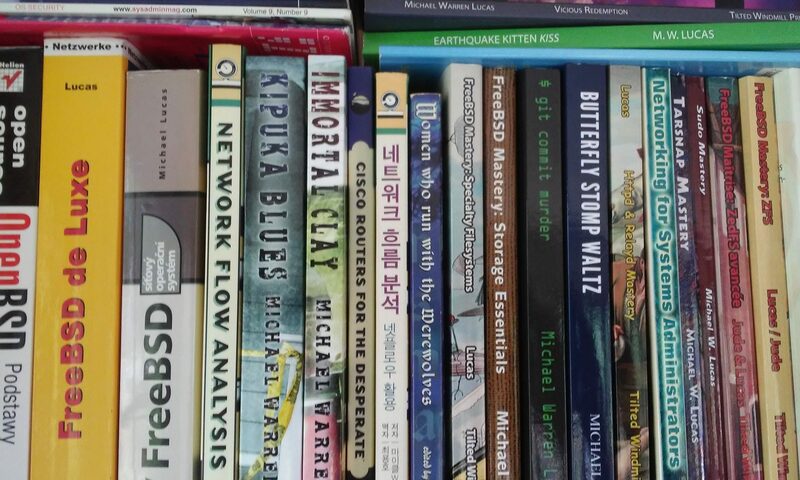 These books sell for list price, but sales support the OpenBSD Project. Me: Sorry, guys, but I have to charge a couple bucks for myself on this. Them: No, you don’t. You charge us what you would charge any other direct order. Me: Oh, I can do better than that for you. Them: No, we want to pay what anyone else would pay. Me: Really, a discount isn’t a problem. Them: TAKE THE MONEY. DO NOT ANGER US. Me: [gulp] As you command. The end deal they got is better than what I charge Amazon. (Or, to be more accurate, it’s a better deal than the tithe Amazon extracts before condescending to carry my books.) If you want TWP books in bulk quantities, let me know. And if your company uses OpenSSH, get them to donate something. OpenSSH has ridiculous market share, and the developers basically work for tips. You wouldn’t leave a restaurant after a fabulous meal without tipping the wait staff, would you? Then why would you do that with software?